It is kind of a miracle that sites like Groupon and Livingsocial have been able to dominate the field of online deals for that long without any interference of the ‘big boys’ out there: Google and Facebook. 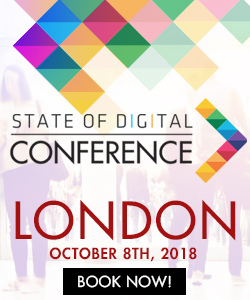 Now within a short period of time both successful social deal – sites saw the two biggest players on the web enter their markets. Google last year tried to buy Groupon but failed. Groupon felt is was just too successful to be bought out. So Google then decided to start working on their own offering site and last week Google offers made its beta-appearance. 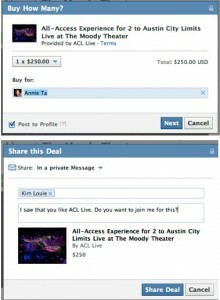 And if that wasn’t enough competition yet Facebook this week decided to launch “Social Deals“. Let’s start off with Facebook. The Social Network already had a “Facebook Deals” running. This however was a different kind of deals-program on the website, a deals option for advertisers which focussed very much on local and mobile, connected to Facebook Places. This Deals is now renamed to “check-in deals”, which makes a lot more sense since the deals are offered when you actually check in somewhere. 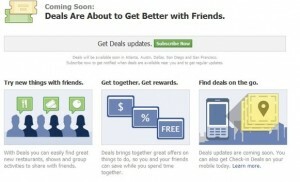 The “new” Facebook Deals are different from the checkins in several ways. 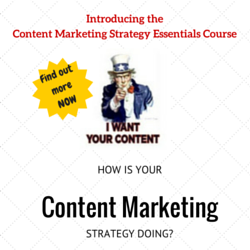 For starters advertisers have to buy them up front. And they can be bought with regular cash but also using Facebook’s ‘monopoly-money’: Facebook Credits. 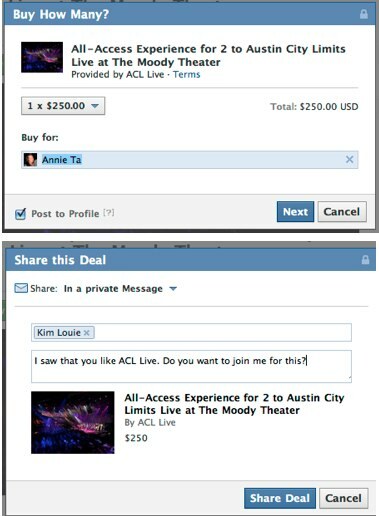 Social Deals are very much focused on local businesses. Offline events and experiences are very much pushed, yes like Groupon and Livingsocial do. Facebook wants to make the online world of Facebook connect with the offline world. You will therefore see more ‘social’ deals like events rather than the regular ‘daily deals’ of products. Interesting to see is that Facebook made a few adjustments to the way you can make a deal: you can like a deal without buying them, you can share and privately invite selected friends on specific deals and e-mail them. This off course being yet another very interesting source of data for Facebook. Facebook Deals starts of as a test service in five cities initially: Atlanta, Austin, Dallas, San Diego, and San Francisco. Very much US focussed again therefore. When Google failed to buy Groupon they were bound to be looking in different directions. Another ‘real’ competitor of Groupon to buy wasn’t really available so making a competitor themselves was the next best thing. And that is what Google is doing. 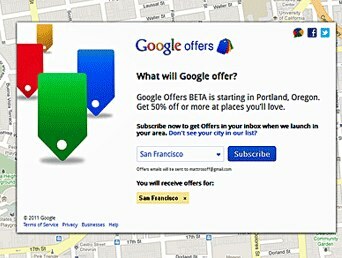 Google is launching Google offers in beta, in Portland, New York, and San Francisco. Again, US only for now. Google had announced the coming of Google offers several months ago. The setup from Google is a bit different than from Facebook. Google really is aiming at discount deals. According to the sign up site, Google Offers will provide 50 percent minimum discounts from different merchants. Google will aim for the products and less for the social part of it. What about Groupon and LivingSocial? What does this mean for sites like Groupon and Livingsocial? Should they be worried? The answer: maybe a little bit, but not just yet. Especially Google’s effort doesn’t look like the Groupon killer just yet. And Google doesn’t really have a successful social history. If you look at the two services Google Offers is a lot more like Groupon, which really goes for offers and also on products, where Facebook is much more like Livingsocial: social events are leading. Most probably Facebook will have the biggest chance of making a difference here. But time will tell.